First Time Subscribers: Save 15% on full-price subscriptions by ordering online! Go to guilfordjournals.com for ahead-of-print articles, most-cited listings, and more. JST Back Volume Digital Archives are now available. Get unlimited access to a deep reservoir of practice-oriented, provocative articles from Vol. 1 (1981) - Vol. 19 (2000) as well as searchability by title, author, or keyword across all archives. Individuals can purchase the full archives. Contact us for Institutional pricing. View the most cited articles and free sample issues! The journal offers clinically relevant, reader-friendly articles, as well as interviews with leading clinicians in the field. 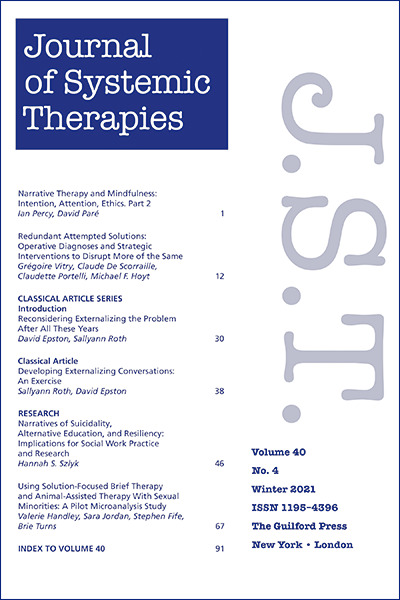 Special issues focus on important topics, such as Process Ethics, Reflecting Teams, and Cross-Cultural Narratives.